"The boys are big fans of serial fiction because they're from comic books. All along, they wanted to do a superhero-type story in a world that it would be believable that people could have superpowers," Silver said. Silver laments that the news media—particularly television—"adds to the cheapness of life" by showing dead bodies on the evening news. He says his movies, by contrast, give people a fun ride, incorporating violence in a stylized, over-the-top fashion that the audience knows is not real. For example, in "Romeo Must Die" the demise of a female villain is shown, surrealistically, from a perspective inside her body, as a stake goes through her heart. "Look, it's a horrible thing to say, but it's more fun," Silver said of the technique, which is also used to show the collapse of another evildoer's spine. "Now, if I say it's fun to put a stake through a heart, it's not going to sound very good, no matter how you write it. I don't ever want to say that violence is fun. These are action movies, and action is fun. "But when audiences saw the collapse of the spinal column, they went crazy. They loved it. They cheered," he continued. "Were they cheering the collapse of a guy's spinal column? No. They were cheering that the bad guy died in an interesting, cool way and you could see it." 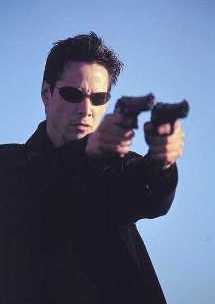 For all its box-office success ($456 million in worldwide ticket sales) and eventual academy recognition, "The Matrix"—which pitted sleek, trench coat-wearing Keanu Reeves against computers who rule the world—still suffered negative fallout when two trench coat-wearing teens opened fire in a Colorado high school last year, killing 12 classmates and a teacher. Even if most people don't read comics, a comic-book mentality is deeply entrenched in our society. From Pokémon to The Matrix, this mentality influences how we think and act. The effects from fictional "entertainment" products—comics, movies, TV, videos, music— seep into reality, where people laugh at death and a producer can't talk without using violent imagery. Incidentally, one wonders how Silver knows exactly what his audiences are laughing at: why someone died or how he died. Perhaps they're laughing at both. And so what if they're "only" laughing because a villain got his "due"? Is that kind of belligerent, bloodthirsty attitude harmless? The answers from religion, literature, and psychology are all no. Vengeance should be reserved for the gods because it isn't healthy for mere mortals.